Interior Metal Wide Panel Ceilings create a robust and distinctive look. Panels are available in widths of 300mm and in various lengths of up to 6metres. This means that fewer joints in the panels are required, which can bring down the cost of your project. 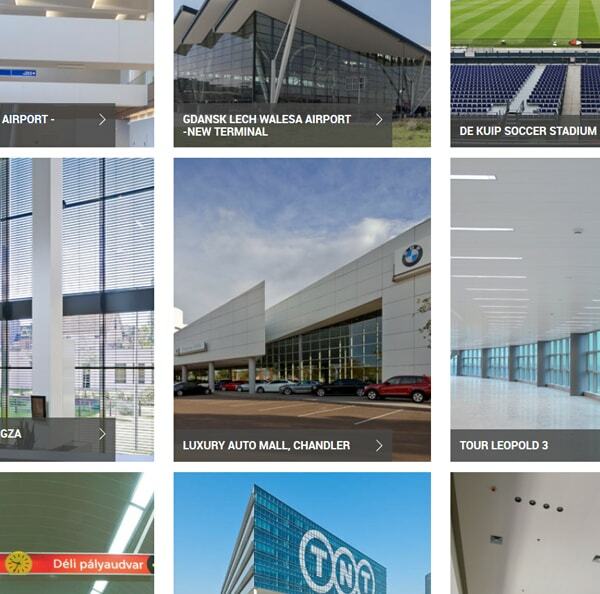 This ceiling is ideal for large open spaces including shopping malls, airports and conference halls. Wide Panel Ceiling systems are perfect for large spaces. A range of appearances can be achieved by using panels of the same width and length or by varying either dimension. All of these looks offer a smooth finish, are minimal in design and easy on the eye. All panels simply lock onto the carriers, without the need for additional locking clips. By using wide panels, a range of looks can be achieved. Using panels of equal or varying length can also create a stunning directional look. Panels are available in lengths of up to 6m. Our wide panel ceilings have 2 joint options, with 2 materials to choose from. There are four different installation options available, helping the ceiling to suit almost any requirement. A range of perforation patterns can be added to the panels to create a variety of acoustic environments. Hunter Douglas interior metal ceilings are available in a wide range of standard colours and RAL colours. We also supply a special range of finishes and colours for bespoke projects. For further information on our extensive range of interior ceiling applications and the colours and finishes available, please contact our sales office. You need not worry about these Hunter Douglas Metal Suspended Ceilings contributing to possible fires as they are classified incombustible. 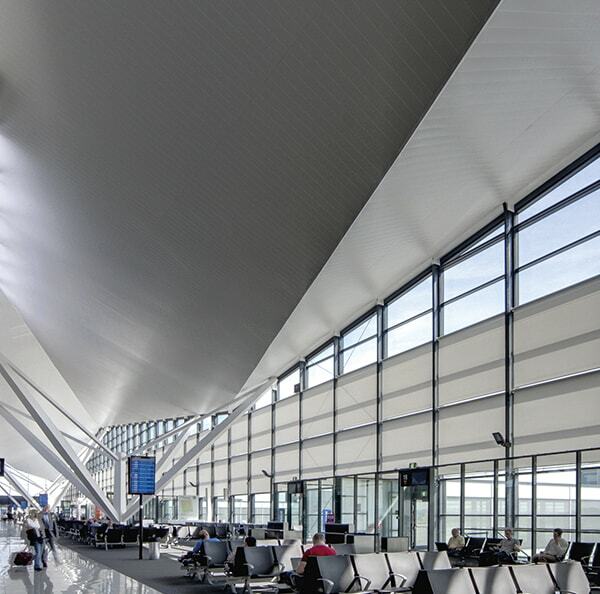 Our Hunter Douglas ceilings offer a range of tested and practical solutions for protecting the structural integrity of a building if a fire should occur. Please get in touch for more information. 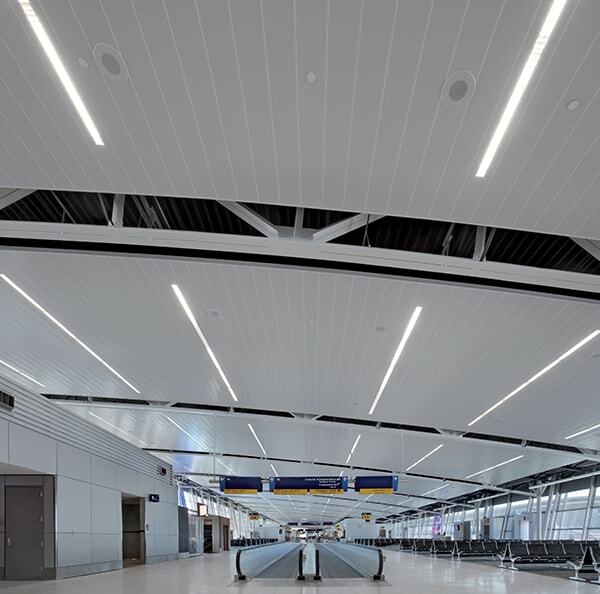 Our Luxalon® wide panel ceilings allow for a range of design options for the architect. They are perfect for creating a smooth, closed ceiling system that is a beautiful addition to any area. With two materials, two joint options, and 4 installation options to choose from, wide panel ceilings can adapt to most environments. Be sure to browse our product gallery for further inspiration. Hunter Douglas acoustic ceilings combine outstanding acoustic performance with stunning appearance, to give a result that is not only stunning to look at, but functional for the space. Our wide panel ceiling systems offer various levels of acoustic performance, depending on the system that you choose. For further details about the acoustic performance of individual ceilings, please visit their respective pages. Alternatively, you can contact us. Environments with poor acoustic properties tend to suffer from problems relating to health, communication, safety, learning and productivity. Enhanced acoustic performance is particularly important in large areas, where sound can dissipate. An acoustic ceiling gives sound a warm quality, while reducing reverberation.